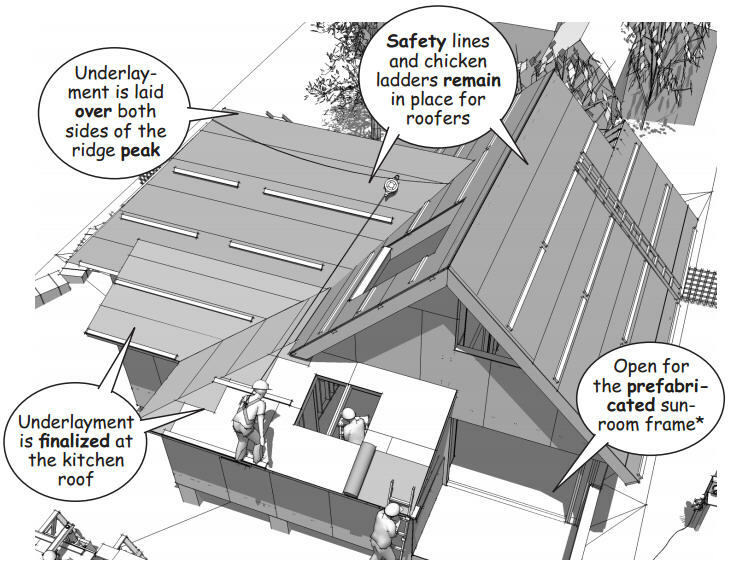 The advantages of the open ceiling that results from traditional roof framing include the more expansive “feel” in the room below and the space gained for lofts or light shelves that is normally lost to trusses. 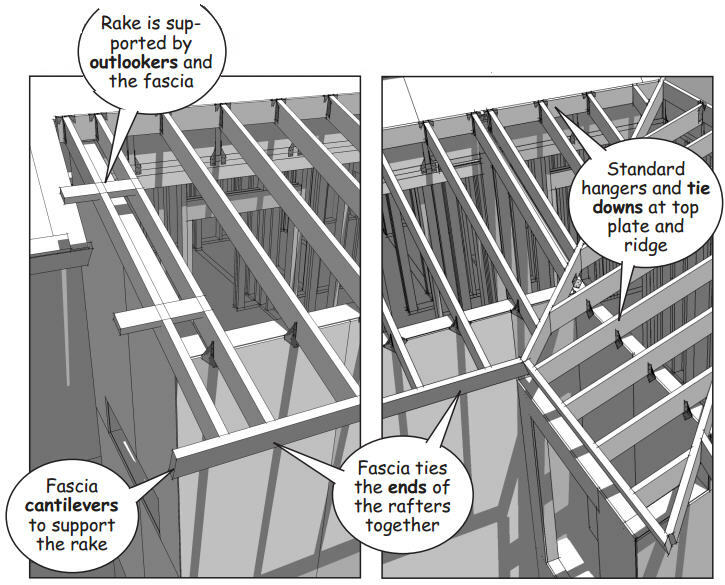 As the framing for the hip roof is completed, sheathing is nailed to the roof rafters to stiffen the frame and tie the roof together as a unified structural system. Note that the sheathing is laid in a staggered pattern and that nail spacing is again specified in structural calculations according to local building codes. Impregnated asphalt felt is rolled out immediately after the sheathing is finalized. The material is lapped and tacked into place with flat-washer-roofing nails to temporarily waterproof the framing below. 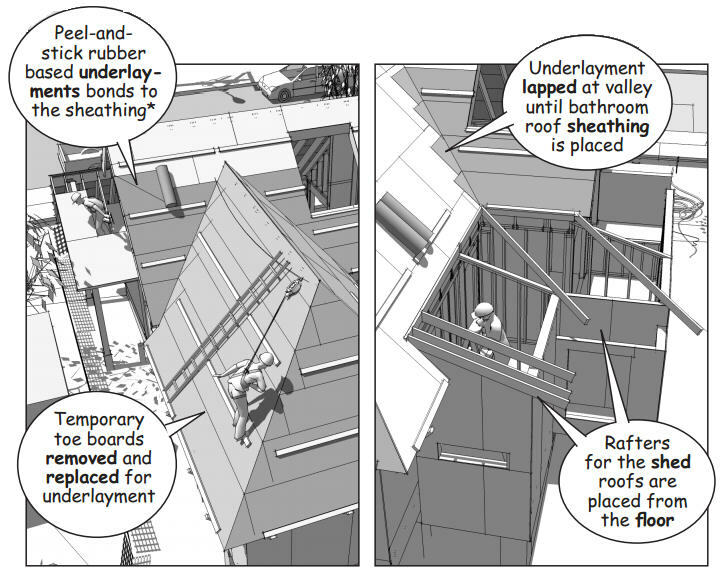 Special high-density and reflective polyethylene sheets are used instead of asphalt felt on larger commercial roofs. In this example, a shed roof is framed over a separate section of the floor plan. The shallow slope of the shed roof raises the ceiling height in the room below. 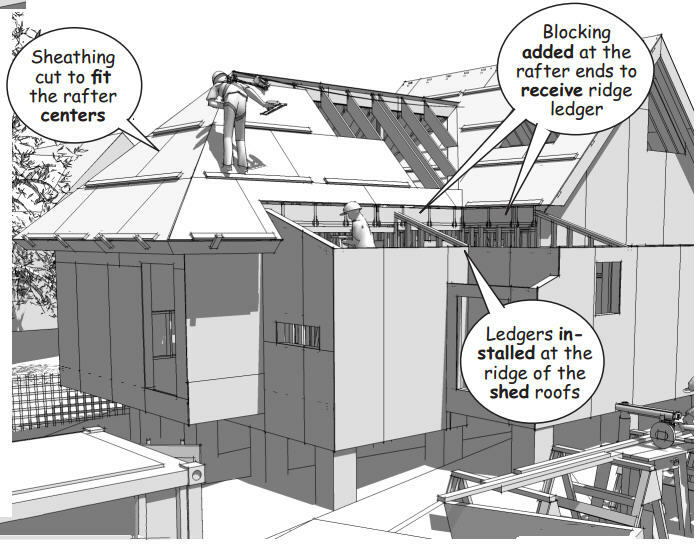 Hangers for the rafters are secured to a ledger along the upper ridgeline of the roof. The rafters then span to bear on the top plate of the perimeter walls. Jack rafters are cut to fit the diagonal at the valley intersection. 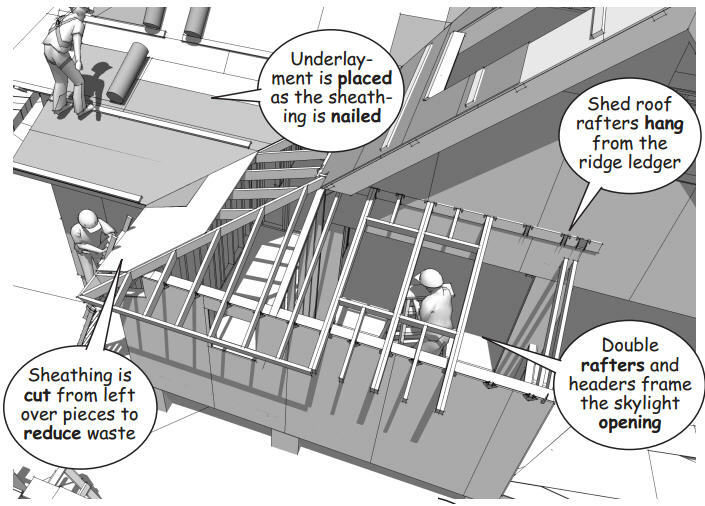 The angle and configuration of the compound cut at the valley make it possible to use full penetration toe nailing through the rafter in lieu of a manufactured structural connector. To minimize waste, blocking is cut from the dropped ends of the rafters as the roof framing is completed. As soon as the sheathing is completed, the asphalt felt underlayment works to waterproof the framing until the roofing contractors can begin their installation. 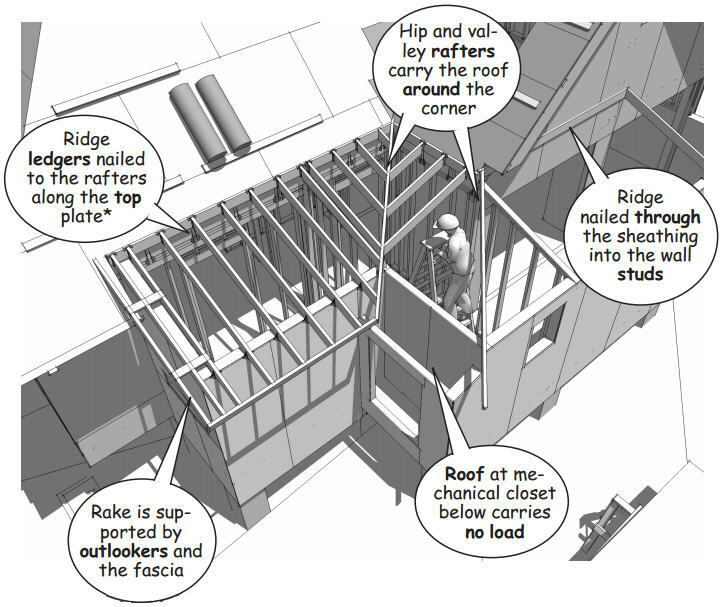 Experienced carpenters manage the effects of rain, snow, and jobsite moisture in order to prevent damage to the framing members and the possibility of embedded mold and mildew that can occur in regions with high humidity.